Expectations were low for Brett Kavanaugh’s confirmation hearing, and Senate Democrats on Tuesday wasted no time meeting them. We can’t tell if they’re going through the histrionic motions or if they might actually try to block a confirmation vote. 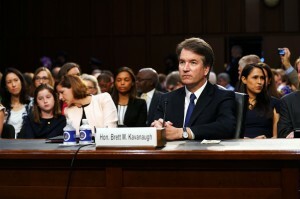 Judiciary Chairman Chuck Grassley couldn’t finish his first sentence before California Democrat Kamala Harris interrupted to demand a hearing delay. Democrats continued to speak over the Chairman even after they were ruled out of order to the jeers of protestors who had to be removed from the hearing room. Democrats interrupted 44 times in the first hour, part of what NBC reported as a “plotted, coordinated strategy” organized by Minority Leader Chuck Schumer over the weekend.